Academy of Fine Arts studies of painting and sculpture. Has lived in New York City for a decade as a freelance artist. Certified Somatic Experiencing ® Trauma Therapist. Additional trainings in Voice Dialogue, Gestalt Therapy for Couples, Systemic Family Therapy (Steve de Shazer), Art Therapy, Training in Couples and Sexual Therapy with Dr. David Schnarch and others. 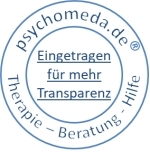 I adhere to the ethical guidelines and regulations of BDP (Bund Deutscher Psychologen).